or what is more commonly known among the locals as the“ Worcester Woods” you begin on, the drive between Lake Elmore and Worcester Vermont on Route 12 is nothing shy of stunning. The drive never gets old, is always somewhat of an adventure, and is often more adventure than most passive motorists would ask for. The feeling of being far away from anywhere makes this stretch of road stunning in so many other ways than merely visually impressive. The remote feel, the push of the forest upon the road, and the fact that there is no power or cell phone service along eight miles of this route result in an uncommon adventure for visitors and locals alike. The village of Lake Elmore, with its expansive view of the shimmering lake and its 19th century village architecture has a settled feel to it, but once you crest the hill outside of town, among the farm fields once hayed by Ferdinand Lacass, drivers should pay attention in order to both enjoy the Worcester Woods and to stay safe while travelling through this “moose alley”. The road surface itself has been upgraded to exceptional levels, almost like a super highway compared to the shape it was before the financial meltdown. 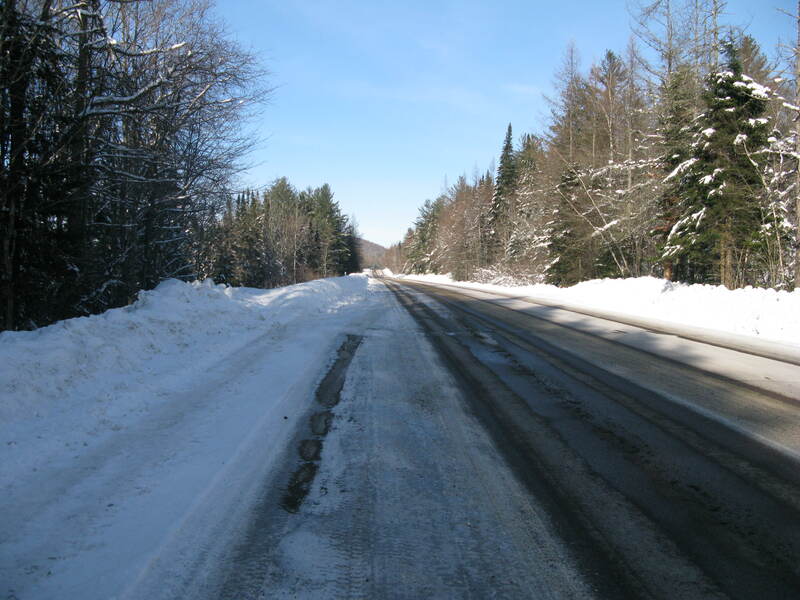 After 2008, Federal funds to improve roads across the U.S. were allocated by Congress and fortunately for Vermont, a huge sum was transferred to the Department Of Transportation for road repair and upgrades. Route 12 between Worcester and Elmore was among the roads which benefited from these funds. 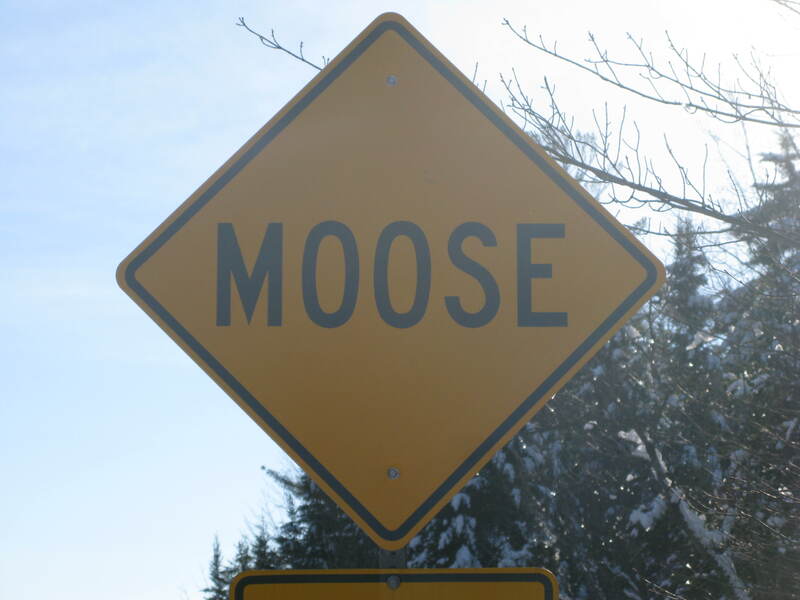 Now people drive too fast on this remote stretch, and the one word that makes this eight miles of road unsafe is “moose”! Moose don’t tend to worry about cars, and they definitely aren’t in a hurry unless they want to be. Once dusk creeps over the Worcester Woods, moose blend in with the darkness, sporting few, if any, light colors that would give them away. And, while most animal eyes would reflect sharply in automobile lights, moose stand so tall that their eyes are often above the beam of car lights and therefore, the moose remains hidden from the driver’s perspective until you are right on top of the looming and very large, beast. People from away hope to see moose when driving along Rt. 12, but whenever I’ve seen a moose, I’ve not been too happy about it. I’ve been driving the route for 18 years, and my colleague has been driving it for over 50 years, having driven many years on a dirt surface that must have been horrendous during mud season! He has hit two moose and totaled several vehicles in his attempts to avoid the wild and unflinching moose which bound away as though a fly were annoying them . When I’ve seen moose it is usually towards dusk, but not uncommonly, I’ve also seen them in the middle of the day, in the dead of night, and in the morning light. Each time I wish the moose had stayed in the woods, out of sight and therefore out of mind. When I’ve seen moose, they have been standing in the middle of the road, usually having wandered into a zone where guard rails edge each side of the road. In these areas the moose are troubled by the low barrier. The moose, being so tall of leg and poor of eyesight, can stumble over low brush and other barriers in its path. And so, having noticed a guard rail, and not knowing it can just walk over the barrier, the moose tends to wander down the center of the road looking for a gap in the guard rail. When I’ve come across moose in this situation, they tend to loupe ahead of the car at a steady but slow pace, almost like the rabbit that runs in front of the dogs at the dog track. Sometimes a moose will emerge abruptly out of the shadows of the woods, charge at right angles to/+89-*wards the vehicle, and then veer off just before hitting the car but doesn’t stop. It changes direction abruptly and with astonishing agility for such a large, gangly creature, and begins jogging alongside the car as if to encourage the driver to move out of the way, which I do, but the walls of the forest close in and cliffs jut out so either the moose or the car will have to give, because the trees and the embankments definitely do not. Or there was the time when I was almost out of the Worcester woods, where usually moose do not appear, and well beyond where the last moose crossing sign is located, when suddenly, rounding a curve after a long descent, two moose, a mother and a yearling, I think, were standing nonchalantly in the middle of the road sniffing the wind. It wasn’t easy to stop, but stop I did, and they stood looking at me as if I were in their way, which I suppose I was given that they own the Worcester woods! road is covered with snow or ice. 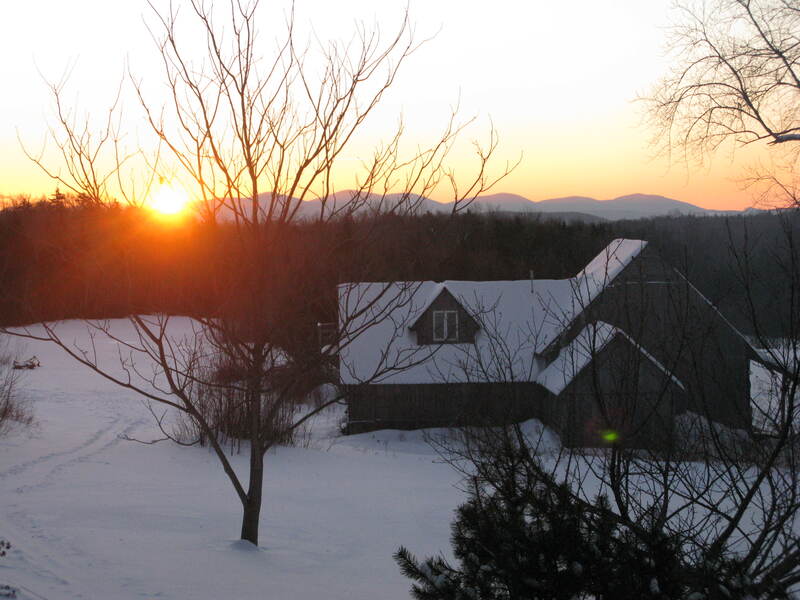 Always, however, I come out of the Worcester woods in a state of wonder at the wildness we still have in Central Vermont. No utility lines, ice too tough to scrape off the roadway in winter, frost heaves that beat cars to death, and moose that wander the remote forest as though man didn’t exist. 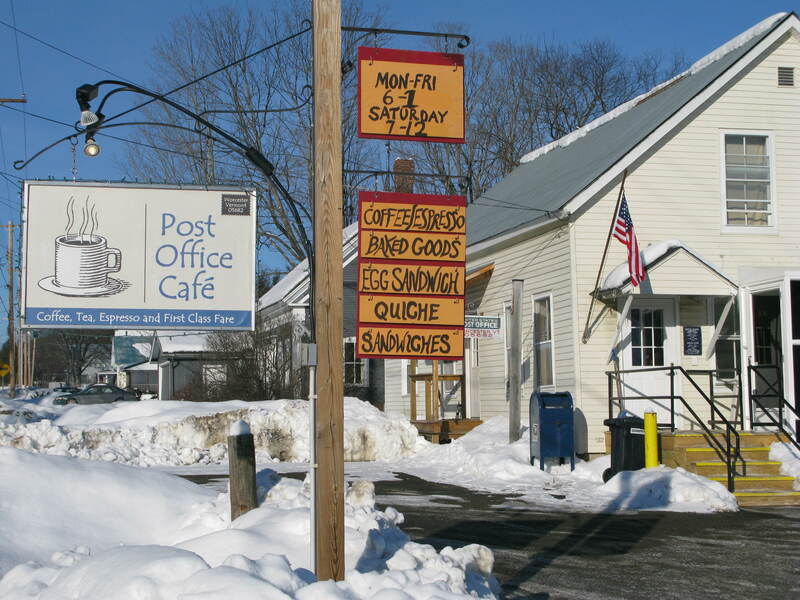 Stopping for a freshly made pizza at the Elmore General Store or some fresh baked goods and locally roasted coffee at the Post Office Café in Worcester are nice treats after a Bonafide adventure through “moose alley”. I just came indoors from splitting firewood in the woodshed. This time of year, whenever it warms up above 20 degrees, I like to split wood by hand. It keeps me in some semblance of shape and I extend the stove wood supply for another couple of days. I learn new things when I go outside, and this morning I learned why the squirrels didn’t show up at the bird feeder for their feeding frenzy. It had dawned on me earlier that the squirrels were absent, although it was a mere fleeting observation. I found out, however, that the owl was lurking about, having posted itself on a nearby branch in clear view of the comings and goings of the squirrels, chickadees, and whatever other creatures were venturing out on the cold morning. I say “the owl” because this owl, a Bard Owl according to my wife and the bird book she refers to, has been a visitor to our house for the past couple of weeks. 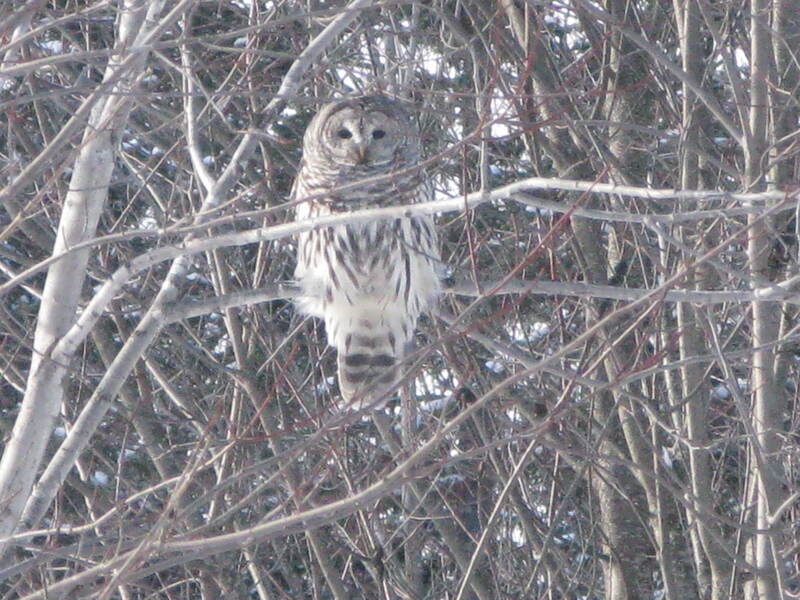 I think owls eat chickadees as well as squirrels, rabbits, and mice. The chickadees were at the feeder this morning, paying little attention to their larger feathered kin. And I saw rabbit tracks in the nearby woods while checking on our beehives and then, on my return to the house, I spooked the owl from its perch and watched it fly into a nearby stand of spruce where it will, I’m sure, keep a keen look out for any squirrels attempting to cross over the snow from the woods to our bird feeder. as the Great Lakes freeze over creating a cloudless weather pattern. Temperatures plunge, like this morning when the mercury bunches up on itself at 15 degrees below zero! As the day dawns with an orange glow beyond the mountain range to the east, I awake to stoke the fires that have burned to embers since I last stoked them at 2:30 am. On the coldest nights of winter such as these in January, wood burns quickly, as though the wood furnace is a hungry bear. The silent snow covered fields stretch before the emerging light, and the barns, frozen trees, and old equipment at the edge of the fields become clear in the dry, cold morning air. Soon the chickadees arrive at the bird feeder. I wonder how they can take the frigid temperatures. Then the jays, the hairy woodpecker, and finally, around 9:00 am the family of squirrels scamper across the frozen snow to begin their daily feeding frenzy.